On 29th of November, IIM Amritsar had the fortune of conducting an Industry Interaction Cell meeting with Ericsson India MD Mr. Amitabh Ray. The session took place in the evening after the classes were over. The students looked forward to this meeting. As the meeting commenced Mr. Amitabh started with the phrase ‘Connected world is just the beginning’. He emphasized that it is almost impossible to predict the future and the various changes that it will bring along with the development of technology. It is difficult to visualize the change in the future of technology. According to scientists the human brain can think only in a linear way, one step at a time, while the technology grows at an exponential rate. Many problems that the human race currently faces will be solved sooner than later by technology has given its fast-paced growth rate, and the former is more likely to occur. This technology is called a disruptive technology. Some examples of disruptive technology are automation of knowledge workers, cloud computing, self-driven cars, energy storage, Internet of things, 3D printing, etc. As per future predictions, doctors, lawyers, engineers, teachers, etc. will soon be replaced by computers and other technology. In about 20 years, almost 70-80% jobs will be automated. People will be without jobs and the government will take care of them by paying them fixed incomes, according to Elon Musk CEO of Tesla motors. It was interesting to gain the insight that, Insurance companies will be most likely to run the automated car industry instead of engineers, etc. there was a small debate regarding automated cars, about an accident that took place with one of the automated cars in the US, Mr. Amitabh gave a beautiful reply saying that technology need not be perfect, it just need to be more efficient than humans. And given the rate of growth of technology that error will soon be reduced to zero. Ericsson is currently working on 5G technology to make Internet of things a reality. Mr. Amitabh had given the example of how mobile internet is a disruptive technology in the healthcare, e-commerce, and virtual money sectors. Based on the various discussions he had in the past, Mr. Amitabh told us that by 2030 life expectancy will be 150 years, more food than people can eat, virtual money, 3D printing, etc. are all likely to become a reality. He said that Dominant logic is the biggest bottleneck for managers today. There are many lenses to see a particular thing, for example, a teenager may view a car as freedom, an employee will view the car as a status symbol and a person from Delhi will view it as a source of pollution (pun intended). Thus as managers, we need to remove the dominant logic process and see through all the lenses to come to a concise decision. In the end, he told us problems can be solved, but paradoxes cannot be solved, they can only be managed. And as managers, we need to learn to manage better because soon technology will be able to fix all problems. These were a few key takeaways from the session. 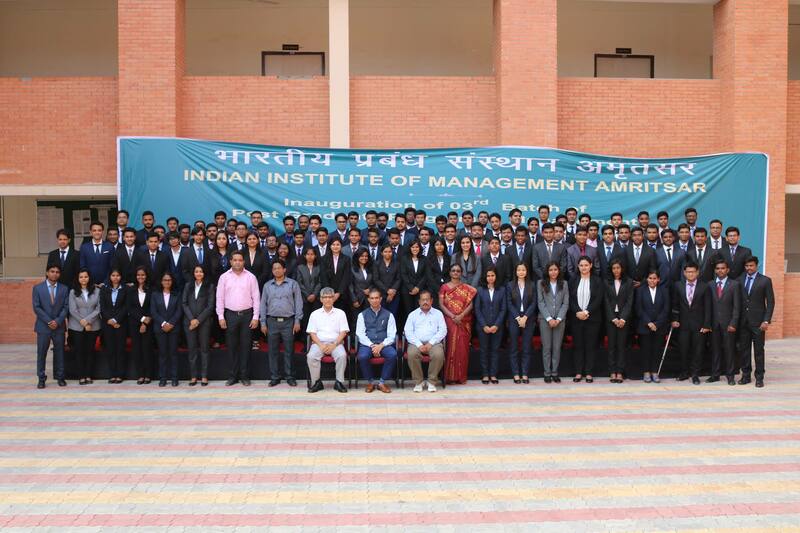 IIM Amritsar was very fortunate to gain this priceless wisdom and they look forward to attending more of these sessions in the near future.